Here’s a treasure from my hoard, a gorgeous type specimen for the Lanston Type Co. printed 25 years ago. Still inspiring! The Fount, Volume 1, Issue 1, Gerald Giampa designer, The Northland Letterpress Co. Ltd. Publisher, 1991. Tabloid size, newsprint. I traversed the book fair floor with an eye to interesting covers and book forms. I was thrilled to see the beauty, the risks, and the variety of books brought to the AWP16 word party. Organic Weapons Arts (OW! Arts) out of Detroit produce 5.5 x 6.5 chapbooks that fall somewhere between trade books and handmade. Kudzu Does Not Bend by Jane Wong has an outsider-arts-and-crafts illustration on the cover. Yes Yes Books is in the photo twice. Dream with a Glass Chamber by Aricka Foreman is a 5.5 x 6.5 chapbook that is so polished I hardly want to call it a chapbook. I’m a fan of Alban Fischer, the designer at Yes Yes, and he can’t help it but make a miniature jewel. Siglio Press is in the photo three times because, well I just want to own every book on their table. Siglio books are singular because they are beautifully executed and are all doorways into extraordinary arts and minds. The colorful book peeking out at 12:00 in the photo is the ecstatic You Who Read Me with Passion Now Must Forever Be My Friends by Dorothy Iannone and edited by Lisa Pearson. Beauty beauty beauty! Immediately below that is Lotería Huasteca: Woodblock Prints by Alec Dempster, Porcupine’s Quill Press. Every book on this publisher’s table had the same toothy paper and letterpressy feeling covers — and no wonder. Follow the links to see how they do it. The interior designs by Canada’s Tim Inkster. To the right of the Lotería is Suite Vénitienne by Sophie Calle (Siglio). It has a gorgeous blue case with a die cut shaped like an eye, and reveals part of the photo on the flyleaf that provides the iris to complete the effect. And this isn’t just a cute device, it serves the work perfectly. Next to the blue Suite, at 3:00 and 4:00 are books by Otis Books, the publishing arm of the Graduate Writing program at Otis College of Art and Design. Traditional typography and photography on the interiors, and always black covers. Propped open is Tlemcen or Places of Writing by Mohammed Dib. Below that, in black is Panic Cure: Poetry from Spain for the 21st Century edited by Forrest Gander. All the books are beautifully traditional, and it is good to know that there is a writing program like this one that show writing students how it’s done. They must chafe against those black covers though! . . . suppose it keeps them focused. “And now for something completely different . . . ” Saturn, by Simon Jacobs published by Spork Press “Bound with prescriptions, dirt, Vangelis, help, more IPA, and Sander Monson Jr” as noted on the copyright page, the book feels simultaneously like a Little Golden Book (the cardboard binding) and a zine (the art). The people at the Spork table showed me a new, larger format product. This is so good, it has to be from Portland, but it isn’t. It comes from Tucson. Note to self: take another look at Tucson. At 7 o’clock is Texas: The Great Theft by Carmen Boullosa published by Deep Vellum Publishing. Support literature in translation! Finally, The Center is Barbaric, The Periphery is Without Lights by Tim Early, Doublecross Press, printed in daring letterpress, metallic silver on black on the cover and black on craft paper on the interior. Big lovely gothic letterforms. Typeset and printed at The Center for Book Arts, NYC by Anna Gurton-Wachter, MC Hyland, and Jeff Peterson. Still lots more to digest from the feast of AWP2016. More soon. If you have a chance, get down there to see it tonight or tomorrow! The Fair is full of creative energy with visual and tactile excitement. This isn’t a fair of stodgy conservative expensive fine editions, although there are a few example of that. This fair celebrates the creative adventure of making books and shows the work of first-time as well as seasoned publishers. 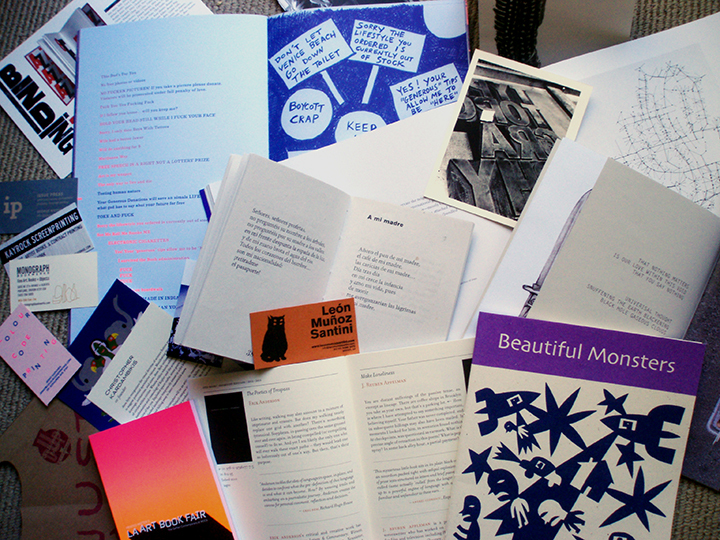 Over 200 exhibitors show off their books, zines, posters, wall paper and ephemera. Artists and produces are there at the tables. With your attention focused in the strange and exciting world of an artist book, or engaged in conversation with a creator, you’ll emerge refreshed by the vitatlity of the book arts! Everything you need to know is in this book. This book is beautifully designed and printed. The books have a ribbon bookmark. Mine is set on the spread of ratios. At one time I worked through the math and proportions for every book I designed. Eventually, I had a body of experience that I could refer to — templates, notes, and printed results of my efforts. At this point, amazingly enough, some of it now part of my own body. That is, I can amaze myself by drawing boxes or choosing positions on the page that turn out to be in proportion if I check the math. I’ve absorbed the aesthetic. This great book appears to be out of print. I have a copy that was issued by Chronicle Books in 1993. The process and methods in the book are pre-desktop computing. The book is richly illustrated with examples of book design from the 1960. Adrian Wilson worked at a time when comping was done by hand and the designer communicated their vision to various craftspeople who worked in other buildings or other towns. Those methods enforced a clarity of vision that we do not need in a world where we can create a visual faster than we can imagine it. Covers type, papers, binding, boxes for limited editions — I return to this book again and again for inspiration.